WhiteCloud Software Ltd. announced the announce the release of version 3.9 of EAComposer. An innovative and simple-to-use enterprise architecture tool used it to manage your IT landscape and technology portfolio. Delivered as a pure SaaS product: cloud hosted with a subscription based license model. In this release we have made improvements to our infrastructure architecture and core platform. We have evolved EAComposer to a truly global real-time SaaS Enterprise Architecture tool. 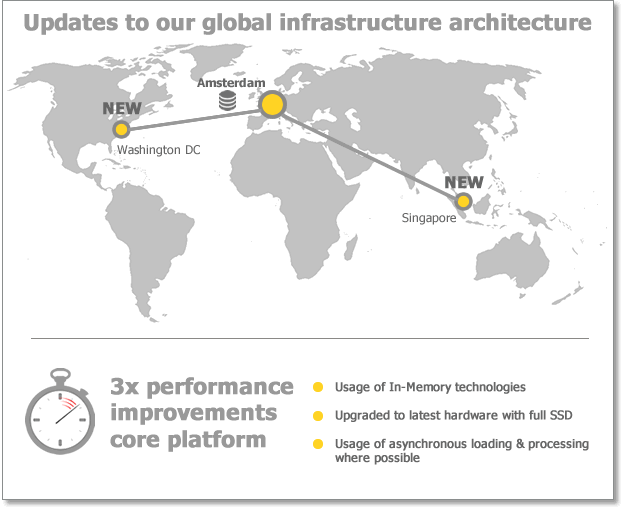 Expanded our infrastructure footprint in Asia Pacific with new servers to improve response times and the overall experience to our Australian and South East Asia users. Also added new servers in North America to achieve the same improvements for users in that region. Needless to say our global enterprise customers which often have users across different regions also greatly benefit from these expansions. Upgraded our European data center servers with all new hardware and streamlined the connectivity between our 3 global data centers. Several enhancements to the core EAComposer software platform which resulted in significant performance improvements. We have seen on average 3x faster response times when loading pages that contain a lot of information like your Architecture Portfolio. Enhanced the core platform with improved Web Services and Real-time Notification capabilities. These capabilities will also be further leveraged in REST API enhancements which is part of Release 4.4 (Q4 2017) and Collaboration improvements which is the main topic of Release 4.5. We will continue to push the performance of our product as we strongly believe a "snappy" response of the product directly contributes to improved user experience and increased user productivity. Our next release is going to focus on improving the Reporting & Analysis feature of the product. We released the first version of that feature last October and we now have list of enhancements & improvements to start maturing this feature.